Priyanka Chopra and Nick Jonas currently in the USA completing their work commitments while also spending quality time together. 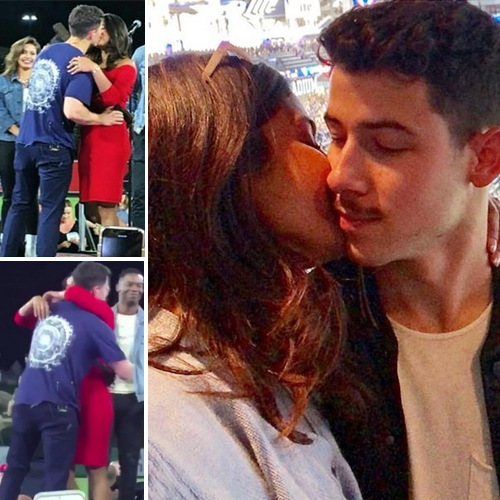 Priyanka and Nick have been giving us solid relationship goals. Yesterday marks Nick's 26th birthday and his ladylove went all out to make it special for her fiance. The couple, along with Nick's brother Joe Jonas and their close friends, celebrated Nick's birthday at a baseball stadium in LA. Besides honing his baseball skills with Joe in traditional jerseys, Nick was also center stage cutting his birthday cake with Priyanka beside him. After blowing out the candles and cutting his birthday cake, Nick walked up to Priyanka and shyly planted a kiss on her lips. This is the first time we've seen NickYanka kiss publicly and it was a moment to capture.